Did you think I was finished sharing prizes in my 3rd Annual Livin' La Vida Low-Carb Blogiversary Giveaway Contest? Not by a long shot! There are so many people entering this contest that I wanted to make sure a good many of you will win SOMETHING. I really wish you could all win a prize, but you do have an excellent chance with so many up for grabs. For those of you who haven't entered yet, you'll be pleased to know I extended the deadline for entering through May 1, 2008 at 11:59PM. The winners will be chosen at random on Friday, May 2nd and announced at my blog soon there after. CLICK HERE to find out how to enter TODAY so you'll get your name in the hat to win some truly remarkable gifts from the sponsor companies who support the "Livin' La Vida Low-Carb" blog. You can see the prizes I have already highlighted here, here, and here. Compliments of our friends at Netrition.com, we are pleased to offer a $25 gift certificate to the reader who wins this prize. Netrition has a full line of products to help you on your low-carb lifestyle, so check 'em out the next time you have a need for low-carb foods. Special thanks to Tom for his generous donation to my blogiversary contest. Jason at LO-CARB U is another one of the fine low-carb retailers out there today. He specializes in shirataki noodles and other such niche, hard-to-find low-carb products, so be sure to see what he has to offer you for your low-carb lifestyle. THANKS for donating four $25 gift certificates to my contest, Jason! 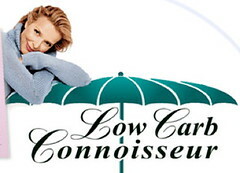 Finishing up the low-carb retail giveaways is this $50 gift certificate to Low-Carb Connoisseur. My friend and fellow South Carolinian Elaine Payne has one of the longest-running online low-carb retail stores that I'm sure you will absolutely fall in love with if you try them out. Elaine will personally take care of your low-carb shopping needs and I can vouch for the excellence she brings to her job. THANK YOU for your gift to my blogiversary giveaway, Elaine! One of my most popular podcast shows this year has been an interview I conducted with nutritionist Monica Reinagel. Unlike most of her fellow colleagues in dietetics, Monica understands the role of inflammation and its connection to health and disease. 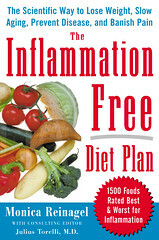 Visit her Inflammation Factor web site to understand more about this phenomenon and get the full scoop on this subject in her outstanding book The Inflammation Free Diet Plan. Monica has so wonderfully donated an autographed copy of her book to one lucky reader, so good luck! THANK YOU Monica for your outstanding giveaway. We've all tasted tea, but have you have the new White Tea from LIPTON yet? First discovered in the Fujian province of China, this white tea product is plucked by hand from the tips of young tea buds before the leaves blossom to preserve the natural goodness of the whole leaf with a rich concentration of protective flavonoid antioxidants. No further processing takes place so it maintains its delicate flavor and a clear liquid color. The light taste of white tea blends well with the other natural flavors, like tangerine, peach or raspberry. 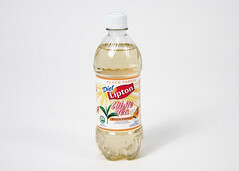 Three of you will get to try the Peach Papaya flavor with five bottles of the LIPTON product to try for yourself. THANKS for your prize donation, LIPTON! I've tried these and they are absolutely amazing. So, am I done sharing all the prizes NOW? Not by a long shot! I told you there would be enough for a whole lot of winners and I wasn't lying. In fact, some of the best prizes are still to come, so keep checking back at the "Livin' La Vida Low-Carb" blog to see even more in the coming days. Don't wait to get in on the action, ENTER TODAY to become eligible as so many of your fellow readers have already done. We're gonna have well over 100 prizes to give away before its over, so don't miss out! swing by the MizFit if youre even in the neighborhood as Im giving away a bike they GENEROUSLY donated! Love the gift certificates from Netrition, Lowcarbconniseur and LowCarbU, maybe even others that I have missed. With so many prizes this is one great celebration you are having. Congratulations on your Blog being so successful. I was just reading on Yahoo this AM, that Bloggers can be one of those "great unknown jobs/careers". Here is the link http://education.yahoo.net/degrees/articles/featured_10_great_careers_you_never_heard.html, thought you might enjoy reading this if you haven't seen it.